Are your meetings or your focus ever interrupted by the announcement of a visitor's arrival? Are there gaps in your visitor logbook? People who do not sign? Are you often occupied when the delivery guy needs your signature? Need visitor photos to compliance or workplace security reasons? Want to have guests sign legal documents to protect your intellectual property? Looking to cut costs while offering modern office visitor registration? No matter what your organization does, or the unique needs of your reception area, a visitor sign in app offers solutions to each of your problems, including ones you haven't even considered. A visitor sign in app is the core of a visitor management system that use smart office technologies to streamline the reception process, in a high-tech, yet user-friendly package. So what exactly can a visitor sign in app do for you? What is a Visitor Sign-In App? A visitor sign in app is a high touch technology app you can download to your iPad or Android tablet. 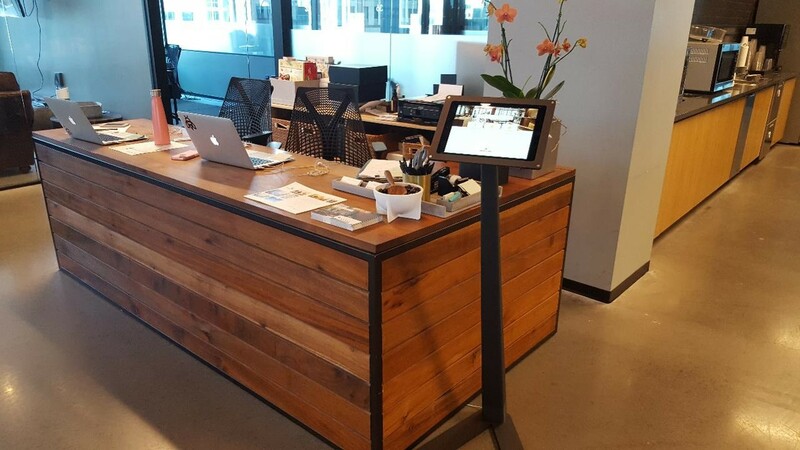 Placed in a kiosk, this software allows visitors to check themselves into your office. Your sign in app is ready for visitor registration 24 hours a day. It offers a silent, seamless notification system to take your visitor from the entryway to your desk without any disruptions. It can register and photograph your visitors, receive deliveries for you, and notify you of a visitor's arrival, promoting efficiency, security, and your tech-savvy image. Instant Reception Notifications- No more waiting in the lobby for your visitor, or having a receptionist buzz into your meeting. The sign in app can alert you of a visitor's arrival silently via call to your smartphone, text, email or Slack, immediately upon their arrival, based upon your personal preferences. You can even set up multiple check-in app kiosks if you have a busy visitor reception area. Visitor Photos & Badges- It's crucial to minimize security risk. The sign in app can take photos and print name badges for each of your visitors, leaving no room for uncertainty. You can quickly distinguish a guest from an intruder, and greet your guests confidently with their name tags in place. Digital Visitor Log Book- So long, illegible visitor log book. No more manual data entry to track who has visited your site. The sign in app tracks each of your visitors and the date, time, and purpose of their visit, as well as who they are meeting. It accepts food deliveries and packages, maximizing your workflow and minimizing interruptions. The sign in app is extremely customizable, allowing you to do things like thank visitors for coming, or set up special event visitor logs. Employing a receptionist often involves salary, benefits, and paid time off. A physical receptionist will sometimes step away from the desk, go on lunch break, or be stuck on a phone line when visitors arrive. This is especially problematic if your company operates during varied work shifts or handles sensitive information. A manual reception system leaves room for costly human error. A receptionist can't remember every name and face, or know why each visitor is there, without prying for information. The cost of a receptionist or a security breach can be a huge hit to a company. There are even more costs to no receptionist or visitor management policy. Distractions cost your business money and employee morale. It also means strangers roaming through your office whether they should be there or not. Today's modern offices use a visitor sign-in app. This solution is a fraction of the cost of dedicated reception staff while it makes your workplace safer, more efficient and more productive than ever. And your visitors will love it too.